Morro Castle ) is a picturesque fortress guarding the entrance to Havana bay in Havana , Cuba . Juan Bautista Antonelli, an Italian engineer, was commissioned to design the structure. When it was built in 1589, Cuba was under the control of Spain . The castle, named after the biblical Magi, was later captured by the British in 1762. Morro Castle in Havana shares the name with other structures in Santiago de Cuba and the Castillo de San Felipe del Morro in San Juan, Puerto Rico . Perched on the promontory on the opposite side of the harbor from Old Havana it can be viewed from miles around as it dominates the port entrance. Built initially in 1589 in response to raids on Havana harbor, el Morro protected the mouth of the harbor with a chain being strung out across the water to the fort at La Punta. 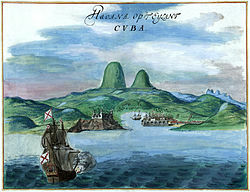 It first saw action in the 1762 British expedition against Cuba when Lord Albemarle landed in Cojimar and attacked the fort defended by Luis Vicente de Velasco e Isla from its rear. It fell because the British could command the high ground. So when they had handed the island back n 1763 to the Spanish, the fort at La Cabaña was built to prevent this happening again. Inside the gates is an exhibition on the lighthouses of Cuba – El Morro once housed a school for lighthouse keepers. There was actually a watchtower here until the British blew it up in their successful siege in 1762. The lighthouse was added in 1846. The cannons around the fort are now badly rusted but the walls are in great shape. The fort has central barracks up to four stories high. A small underwater archeology exhibition is also located here. Noteworthy are the old latrines and their chute into the sea as are the two sets of doors and the drawbridge mechanism. The current harbor master's office is still housed in the fortress. A plaque dedicated by the ambassador of the United Kingdom commemorates the 1762 siege and a small memorial is located between two strong powder rooms in the North East Bastion. A small turret at the end of the wall offers views of the sea crashing onto the rocks 20 meters below and take in the dimensions of the huge dry moat. The opposite side of the moat holds more modern guns and cannons, La Bateria de Velasco, and offers a sweeping view down to Cojimar . Image:Castillo del morro.jpg|El Morro Castle seen from Havana.Image:HavanaBookFairMorro.JPG|Bridge pass between Morro and La Cabaña .Image:MorroHavana.JPG|Morro captured from bottomImage:El Morro 24 January 2008.jpg|El Morro view from roadside on January 24, 2008. Seen on the McDougal Littell textbook ¡En español! Level 2. Morro Castle appears in the movie "The Ghost Breakers" (1940),in the background as Bob Hope and Paulette Goddard enter theharbor by ship.